President of India, Shri Pranab Mukherjee delivered the 1st Bhairon Singh Shekhawat Memorial Lecture on the topic “History of Parliamentary Democracy in India” today (May 15, 2017) in Jaipur, Rajasthan. He also presented the 1st Bhairon Singh Shekhawat Life Time Achievement Honour in Public Service to Shri Pawan Kumar Chamling, Chief Minister of Sikkim on the occasion. 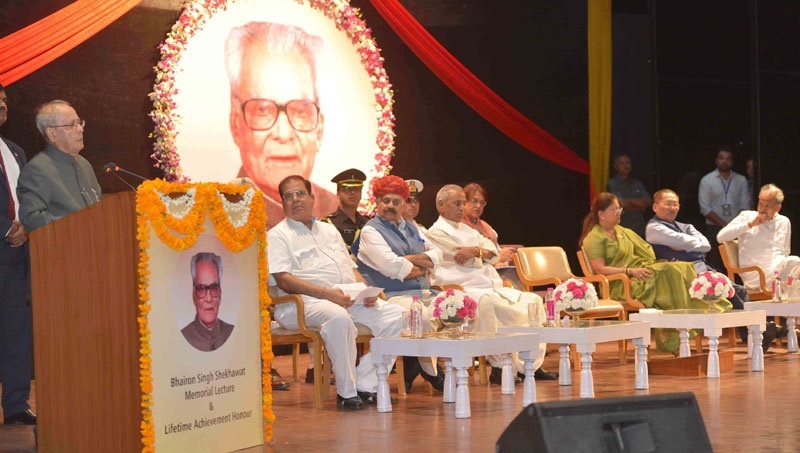 Addressing the gathering the President said he was honoured to be invited to deliver the inaugural Memorial Lecture instituted in memory of our former Vice-President Shri Bhairon Singh Shekhawat, an outstanding statesman and a man of the masses. The President stated that Shri Shekhawat and he shared a long history of friendship. Both of them served together in the Rajya Sabha in the 1970s. 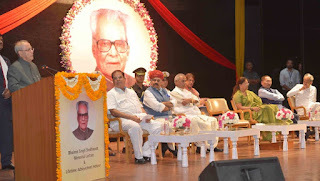 Later, while Shri Shekhawat was Chief Minister of Rajasthan and the President was Vice Chairman of the Planning Commission, he had opportunity to see Shri Shekhawat’s extensive knowledge about problems being faced by citizens of Rajasthan, and his will to eradicate these day to day problems. He was deeply impressed by Shri Shekhawat’s commitment to the downtrodden and poor. The President also congratulated Shri Pawan Kumar Chamling, Chief Minister of Sikkim on being conferred the 1st Bhairon Singh Shekhawat Life Time Achievement Honour in Public Service. He said that Shri Chamling has made unique contribution to the State of Sikkim which has emerged as a role model. In his Memorial Lecture, the President spoke about the History of Parliamentary Democracy in India. He said that he had outlined the history of representative Government for a specific purpose which was to underline the fact that if prominent legislators of pre-independence days with limited powers, could have done so much, how much more can be done by our MPs, MLAs and MLCs of today. The President said that the 3 Ds – Debate, Dissension and Decision are essential in a Parliamentary system of democracy. Democracy should provide for an enabling environment which helps every section of the society to fully participate in the process of governance.